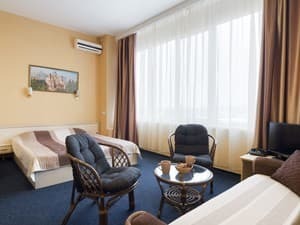 Comfortable “Aissotel” hotel located in the historical center of Kharkov, 5 minutes from the metro station “Istorichesky Mesey” (Historical Museum). 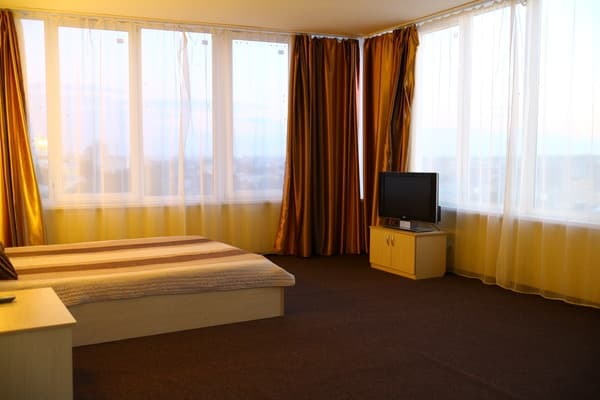 Rooms consists of 3 double standard rooms (located on the 1st floor), 13 double rooms category Standard Plus (located on 1-5 floors of the hotel with good views of the city), 3 single rooms are junior suites with panoramic views of the city (located on the 6th floor of the hotel) and 4 suites. 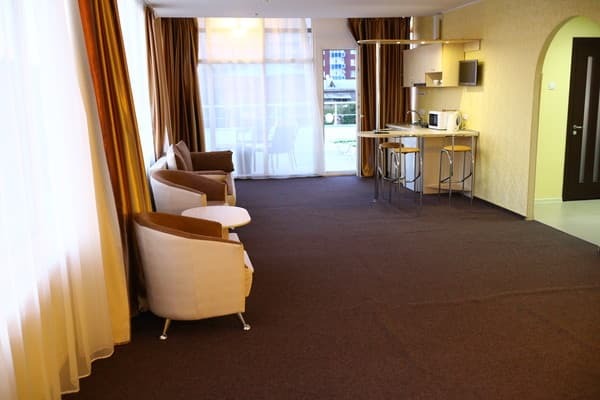 All rooms are equipped with everything necessary for a good mood and convenience of guests. Description of the room: Standard Room, sleeps 2 people. Double bed or 2 separate, necessary furniture, TV, refrigerator, towels, cups, glasses. Description of the room: Standard room, sleeps 2 people. 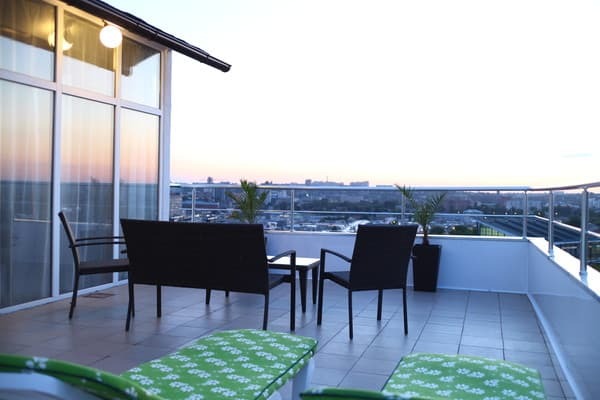 There are 2 single beds and necessary furniture, TV, refrigerator, towels, cups, glasses. Description of the room: Comfort Room, sleeps 2 people. Double bed, necessary furniture, a work desk, TV, refrigerator, towels, cups, glasses. Description of the room: Junior Suite. Maximum occupancy is 4 people. Panoramic windows overlooking the city. 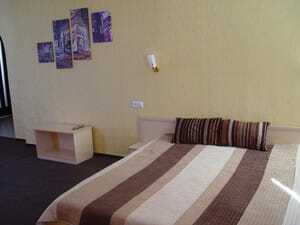 Double bed, sofa, necessary furniture, TV, kitchenette, refrigerator, microwave oven, electric kettle, dishes, towels. 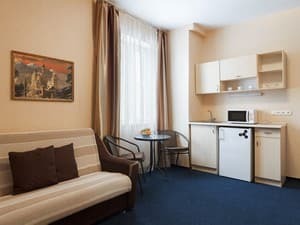 Description of the room: Junior Suite. Maximum occupancy is 4 people. 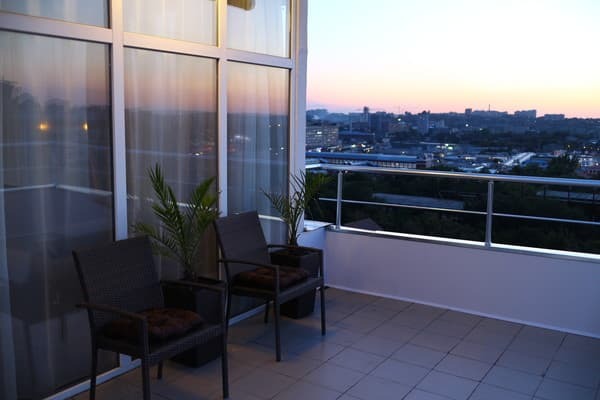 2 Komnaty.V double bed, sofa, necessary furniture, TV, mini-kitchen, fridge, microwave oven, kettle, poltentsa. 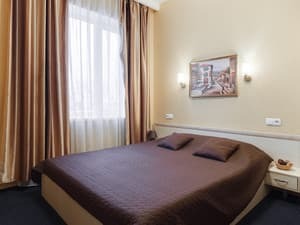 Standard rooms - without extra bed (accommodation for up to 3 persons). Suites and junior suites have a sofa bed and a double bed, accommodation for up to 4 people. City center. Metro station “Istorichesky Musey” (Historical Museum), down the Rymarska street and Klochkovskaya street towards Planetarium - 5 minutes walk. 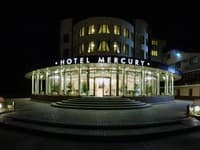 Metro station “Istorichesky Musey” (Historical Museum), down the Rymarska street and Klochkovskaya street towards Planetarium - 5 minutes walk.